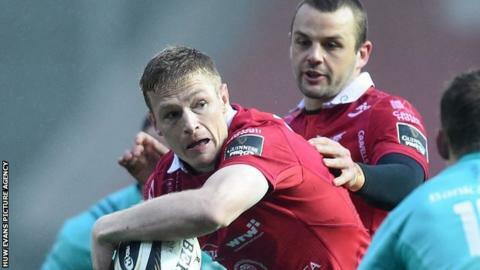 Johnny McNicholl has agreed a new contract with Scarlets. The 28-year-old, who plays wing or full-back, is the fourth signing by the region in a week after Wales internationals Jonathan Davies, Ken Owens and Rob Evans agreed to stay. New Zealander McNicholl has scored 27 tries in 59 appearances since joining Scarlets in 2016 and will qualify for Wales on residency in December 2019. "I am happy that everything has been finalised and I'm staying," he said. McNicholl will be re-united with Brad Mooar, who takes over at Scarlets when Wayne Pivac leaves to become coach of Wales later in 2019. "We have had some great success over the last couple of years and hopefully there is more to come," added McNicholl. "I'm looking forward to reconnecting with my former Crusaders coach Brad Mooar and feel there are exciting times ahead." Pivac leaves his role at Parc y Scarlets in the summer before taking over from Warren Gatland as national coach following the World Cup in the autumn. He said the Scarlets' signings were a clear statement of intent by the region. "He [McNicholl] has been one of the most dangerous attacking threats in the Pro 14 in recent years and played a big part in us reaching successive finals and a European semi-final," said Pivac. "With the news of Jon, Ken and Rob signing last week, this is another significant signing for the Scarlets. The squad is looking strong for next season."